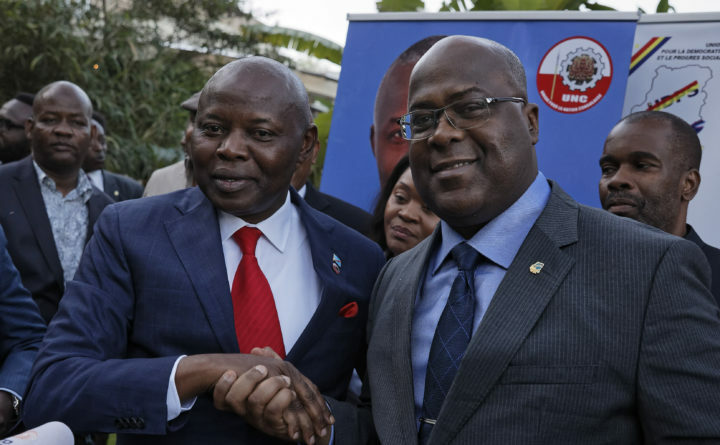 Felix Tshisekedi, right, of Congo's Union for Democracy and Social Progress opposition party, shakes hands with Vital Kamerhe of Congo's Union for the Congolese Nation opposition party, after being endorsed Kamerhe at a press conference in Nairobi, Kenya Friday, Nov. 23, 2018. President Joseph Kabila of the DRC, on the other hand, is actually leaving the presidency after a mere 17 years in power. He hung on for two years past the scheduled election in 2016, offering a series of increasingly absurd reasons for the delay, but the election will actually be held on Dec. 23 — and Kabila will not be a candidate. So two cheers for democracy in the DRC. Kabila Jr., having initially been very reluctant to take the job (presumably because of the high fatality rate), eventually got into the spirit of the thing. He proceeded to loot the DRC for a further 17 years — Bloomberg reports that his wife, children and close relatives hold 120 mining permits, the main source of money from bribes — and was naturally most reluctant to leave office when constitutional term limits obliged him to step down. Since the opposition vote is being split in this way, Shadary will probably win — and Kabila could be back four years later. Or he could end up dead. Any of them could. The political game in the DRC is played for high stakes, but it rarely if ever focuses on the welfare of the citizens.